Hi all, I know this may raise a few eyebrows but I do not have any other options. Our garden is surrounded by trees that are not ours in neighbouring gardens and on the ginnel behind our property (council owned). I have decided to go artificial just because it is not possible to maintain the grass. I have started the prep work but am slightly concerned by tree branches like the one I have attached that are under the lawn. I will of course put layers of sharp stone and sand before I lay the grass but should I be worried about these branches. Will they rise? Should I cut them or will that be problematic later with the rot?? If these are roots, then I think any number of things can happen, including injury from all the digging and construction causing them to sprout water sprouts. Also, I don't know anything about artificial turf, but is there chance of the roots getting smothered? When the trees shed leaves and drop dead branches, do you rake and sweep? Vacuum? What about sap and bird droppings....? What happens to all the macro and micro critters that live there? Well there is a guilt to all the damage it will do to the nature yes..and believe you me it is going to be done begrudgingly for that reason alone. No matter, I want the place to be nice for my wife when she gives birth in a month. Mulch is a great idea but it is a really small garden. We live in a terrace house so a mulched area would just consume too much space and just would not look right. I kind of braced myself for people to flame me for going artificial but honestly it is an area of land that will not grow grass how I want it. Quality of artificial grass varies dramatically and we have opted for a very high quality just because it looks excellent. You can go cheaper but you get what you pay for and there is no point in scrimping when we only have a 4x8 metric garden. Maintenance wise, it is very easily managed with a very diluted detergent (cleaned bi monthly) and regular combing using a wire brush. Having a garden vac is a necessity. What I really want to know is, when I lay down the sharp stone underlay and sand (and weed membrane ) will this affect the stronger roots of the tree in anyway and cause 'lumping' of any sort? I am guessing not as essentially a trees roots are used to gather water but thought someone might be able to give me some advice and guidance on this. I honestly don't know, but if the roots don't stick up by the time you have dug down to put down the sand etc, I don't see why putting stuff on top will make them do something different. Most important thing is to have a level surface. *you could make a moss garden. Yes (no?) not flaming -- I don't think I ever flame, really. But Rainbowgardener said it much better than I.
I second what RBG said. No flames from me, we all have to do what we have to do, but fighting with the shady area and trying to make it be something it's not makes a lot of work for you. I don't understand why mulching takes up too much space. 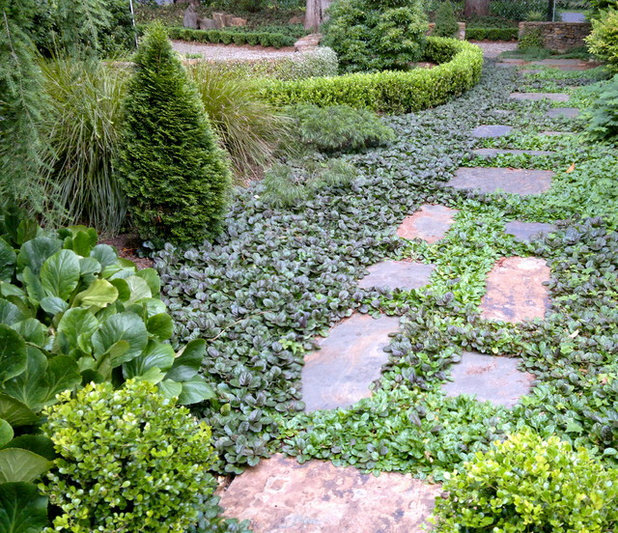 You put down mulch and walk on it; you put down pebbles and walk on it; you put down artificial turf and walk on it. How is the space changed? I believe what you could call most of the options is: hardscaping. There are natural routes and directions that can be taken. Or, products designed to look like something, they aren't. The neighbors across the road were out today talking about the HUGE tree in one backyard, that overhangs the other. It's good to see that the owner of the tree is the one initiating the dialog. At least, I assume he is, since he has been been over at the other's front door and waving his arms at that tree, twice now. He's probably lucky. I honestly doubt that the other guy cares. He has 2 teenagers who do the fall raking and his backyard gets lots of sunlight, in the afternoon anyway. It would be tough to get too little light for even some lawn grass. Asset? Yes, it certainly could be on hot summer days. Dirt can be covered but there are options for use and beauty. The roots rising would depend on the type of tree. Maple roots will push up out of the ground. Most other trees of which I am familiar with don't push out of the ground. Sharp stone will dig into the roots every time you walk on it. This will damage the roots. According to what I read on the 'net, artificial grass won't harm the tree roots. In most cases a little sand over tree roots won't hurt the roots. Some smaller roots can be removed without causing much damage. Removing several large roots will cause damage to the tree. I love the look of moss lawns. I wish I could get one established. 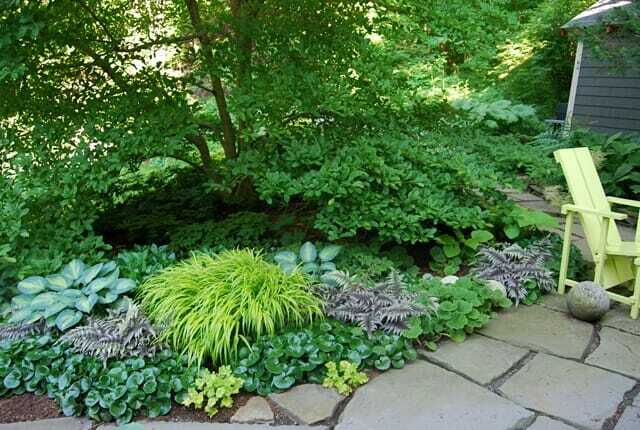 I ended up settling for mulch with shade and root tolerant plants like hosta, ferns, daylilies, and a few other plants. But it's a constant battle to keep weeds like poison ivy and honeysuckle out of the area. Removing grass from around trees that i need to save! What type of grass is this growing?